I offer SUP Instructor Certification through the Professional Stand Up Paddle Association (PSUPA). 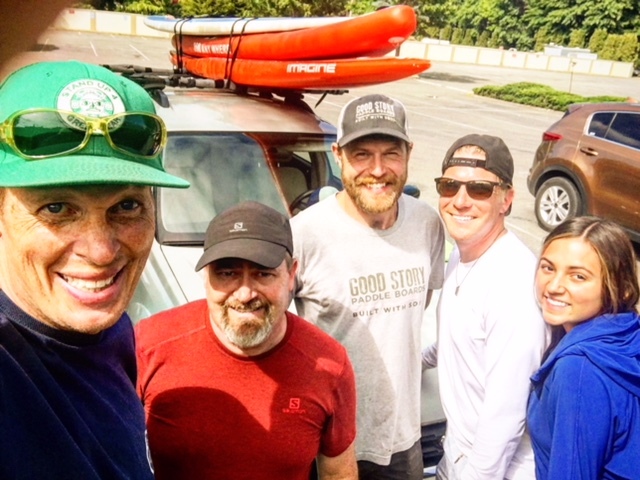 This internationally recognized program is beneficial for both independent SUP instructors as well as recreational business owners who offer SUP instruction and rentals. This course can also be helpful for non SUP instructors seeking an in-depth two day intermediate level course. Who Can Benefit from Instructor Training and Certification? This course covers the skills needed to teach both a 1 to 3 hour basic SUP class confidently and safely. The curriculum includes the PSUPA Water Safety Course and covers the basics of how to start a SUP business, but is also adaptable to clients specialized needs. Certification is awarded upon completing the course, passing all tests, and achieving a satisfactory evaluation. On-water teaching techniques such as standing methods, falling, getting back on, turns, forward stroke, balance techniques, paddling straight, stroke analysis. Access to PSUPA logos to promote your business. Location: Seattle (Ballard) or Deception Pass State Park (1.5hrs north of Seattle). Custom locations ok for groups. Travel fees may apply. Current PSUPA membership. $75yr – Sign up here. Be Advanced Intermediate to Advanced level. You must have a strong grasp of SUP paddling techniques and directional control. This is not a course for beginners. Not sure of your skill level? Call me to set up a skills assessment clinic prior to the course. I can provide training before the course. Have current hands-on (i.e., not Internet-based) First Aid/CPR certification – or – Wilderness First Aid (with CPR) or Lifeguard Training certification. Be in good physical shape and able to swim 100 yards and to lift and carry all equipment. Not sure of your skill level? Take my SUP 101 online course. All content in this course will be covered in Flat Water 1. Rentals available at no additional cost. Rentals includes all gear listed below. If you’re local. $45 per per/day for all gear. I recommend bringing as much as your own gear as possible so you learn to use it for your instruction. Booties recommended for walking on rough beaches and for additional warmth. Gloves are a good option as well for staying warm during rescues or colder days. *Successful completion of FW1 required prior to taking any of these courses. Each of these are available in custom scheduled classes for individuals or groups. Contact me for More Info Fee: Varies per certification and group. Blackfish SUP, ROW Adventures, Downwind Gladiators, the US Navy (NAS, Everett, Bangor), Gorge Performance, Let’s Go Tubing, Union Paddle & Row Center, Kayak Academy, WWU Outdoor Center, and Urban Surf, Hydrology H2o, Godfather Testing Center, SUP-fari Paddle Adventures, Given to Glide Paddle Sports, Clatsop Paddle, SUP Spokane, The Stand Up Paddling School (Singapore), Port Stevens Paddlesports (Australia), Harbor SUP (Oak Harbor); Sound Yoga & SUP (Anacortes), Wilde Adventures, Alaska Wilderness SUP, H2o SUP Yoga (Portland), Fat Cat Paddle Boarding (Vashon Island), Maliko Shuttle, More Water Time (Maui), Board Locals (CA), Good Story Paddle & Surf, Good Paddle, Anchor SUP (Michigan), Underfoot SUP (Mexico), Club Sake (Seattle). *Custom dates: Weekdays and weekends are available for your group. Contact me to discuss. Location: Seattle (Shilshole Bay) or Deception Pass State Park. Location depends on what’s easier for the group. Deception Pass allows for building your skills in rough water. Custom locations welcome for private groups. Travel fees may apply. Course Fee: 699 per person – Comes with our 80 page FW1 manual and equipment rentals. *CPR / First-Aid Certificate – Required prior to your course..